25 years ago, I used to ride a bike as my only form of transportation along the coastline in the suburbs near Athens. I cycled along the paralia into town daily. One morning, laden down with groceries, dog food and dry cleaning, my bike literally snapped under the weight of the load, crumbling to the road and taking it me down with it. I wasn’t hurt, but my bike lay on the ground contorted, with its neck snapped — fatally wounded with the handlebars still in my hands but joined to the bike’s main frame only by the brake line. I looked like a freak show. With my shopping scattered everywhere, I had to leave the tangled mess abandoned on the curbside to frantically find a phone and call home for someone to come and scoop me up. Turns out my faithful bike was a bit of a wimp. 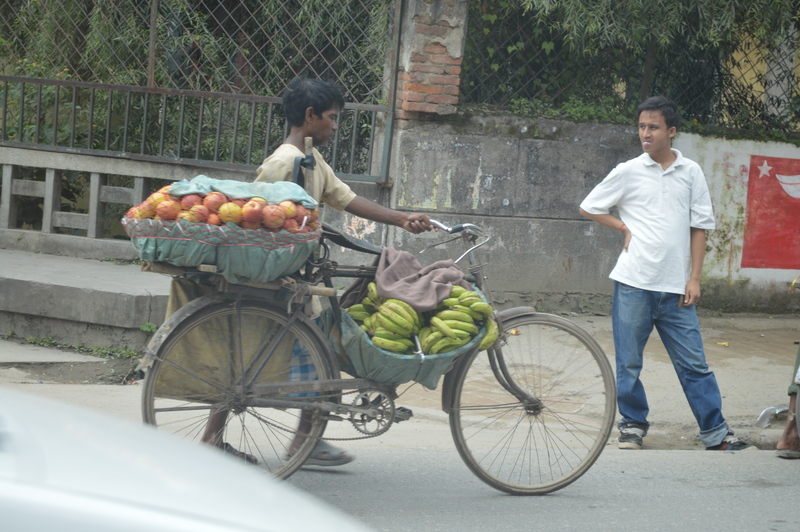 Here in Kathmandu, I remember that experience sometimes when I see workhorse bicycles passing by, laden with extraordinary heaving loads. These aren’t wimpy, modern bikes. But antiqued, sturdy, bone-rattling warriors of the road…which may, or may not, have brakes. They almost always don’t have gears. But what they lack in suspension, they make up for in brute strength. Sometimes they are so overladen they can only be slowly pushed by their owners, who precariously try to balance their load without being run over by traffic or toppled by the many potholes. Or sometimes they’re driven by vendors bringing produce from a farm outside the city on a bicycle-towed cart, or some other creative incarnation of a bicycle that has been cleverly adapted for its owners cargo: the straw broom guy, the furniture sellers or the amazing construction assistants with 50lb bags of cement slung over their handlebars. I’m awed at what I see ferried around by bike. And sometimes I am just horrified. 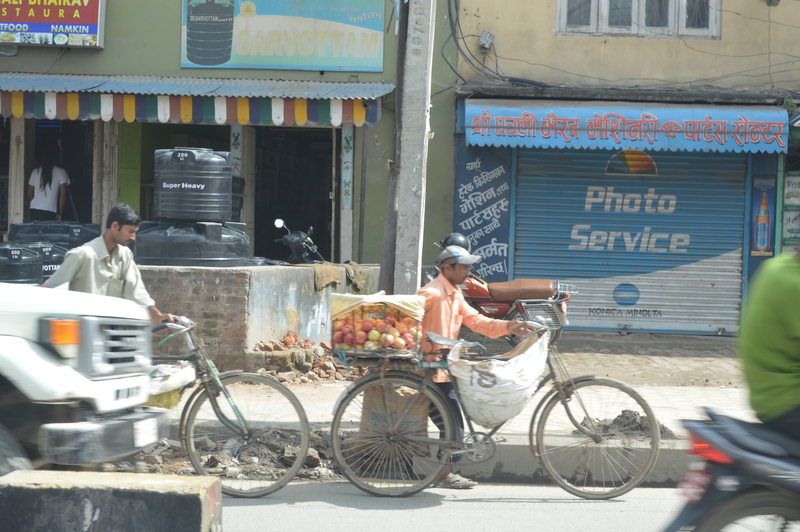 I see people carrying plates of glass or mirrors, untethered small children, or horrible breakable, dangerous things that would end in disaster if someone mis-timed or mis-stepped in Kathmandu traffic. And yet — at least for now — I’ve yet to see that happen. These guys do this everyday, and are very good at it, and their amazing, trojan bicycles keep them in business. This post is was part of the Weekly Writing Challenge, Object ,at dailypost.wordpress.com. Very descriptive – I so enjoyed reading this! Thank you. It was fun to discover how effective the challenge was at helping me remember that day. It’s such a privilege to share this experience. Your writing is so full of colour. You took me there! Thanks. It was scary at the time but I guess it made a good story in the end!